To Prepare the Sponge Cake: Preheat oven to 350 degrees. Seperate the eggs, make certain that none of the yolks mix with the white. Sift the cornstarch and flour. Whip the yolks and 1 cup of the sugar at high speed for 5 minutes, until the mixture whitens and forms a ribbon. Reduce the mixer to low and pour in the water and vanilla. Immediately fold in the cornstarch and flour. Set aside. Whip the egg whites with a pinch of salt in a seperate bowl. Start at low speed; then increase speed as the whites begin to rise. Continue whipping while gradually adding the remaining 2/3 cup of sugar until the whites form soft peaks. Do not over whip. Gently fold the yolk mixture into the whites with the aid of a rubber spatula. Butter and flour the 2 10" x 14" x 5/8" cookie sheet pans. Pour half of the batter into each of the pans. Bake in pre-heated oven for 7-8 minutes. Test by inserting a toothpick into the cake. When it comes out clean, the cake is done. 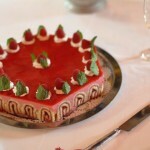 Turn out one of the warm sheets of cake onto a section of wax paper, cool and wrap, reserve for the base of mousse cake. 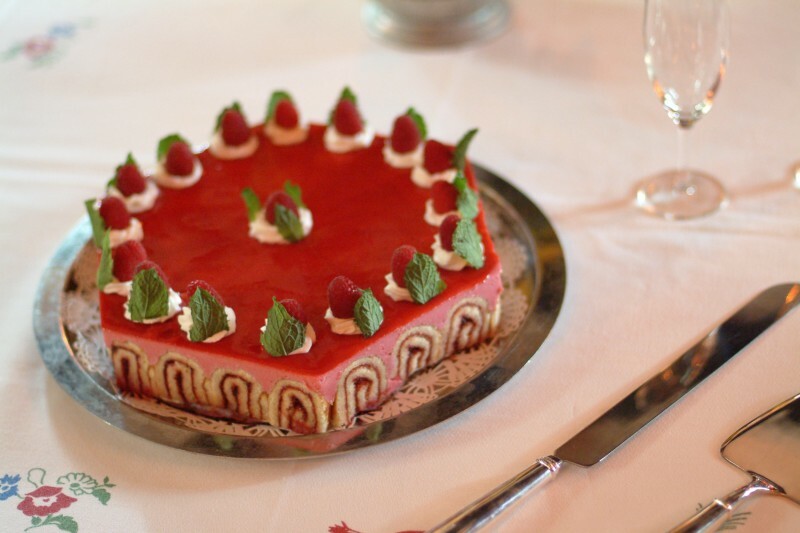 To Prepare the Jelly Roll: Turn out the second warm sheet of cake onto a section of wax paper. Spread the raspberry jelly, which has been warmed and melted on the stove or microwave, evenly over the warm cake with the aid of a spatula. While the cake is still warm, roll the cake over itself to form a jelly roll. Wrap and refrigerate before slicing. To Prepare the Mold: Heat the 2 tablespoons of raspberry jelly to soften, on the stove or microwave. Brush the inside and bottom of the cake pan or ring mold with the jelly. Measure and cut a circle of cake from the reserved cooled sheet, the size of the round cake pan or ring mold. Line the bottom of the pan or mold with the cake circle. Split the chilled jelly roll in half lengthwise. Place the 2 halves left to right in front of you. Slice 1/4 inch cross sections and line them side-by-side around the inside of the mold (sides only and not bottom) You will need 15-17 slices depending on the width of the jelly roll. For the Sugar Syrup: Combine the sugar and water in a small saucepan and boilover high heat. Remove from flame and allow to cool. Flavor syrup with raspberry brandy if desired. Using a small pastry brush, moisten the circle of the sponge cake with the syrup. Some sugar syrup will remain. Cover the circle of the cake with pint of fresh raspberries. Chill while preparing the mousse. To Prepare the Mousse: Purée the 3 pints of fresh raspberries (for mousse and sauce) in a food processor or blender. Strain through a fine sieve to remove the seeds. Approximately 4 cups of purée should remain. Measure out 1 1/3 cups of the purée and refrigerate the remainder for the sauce. Sprinkle the gelatin over the water in a small saucepan; stir to mix. Let stand 5 minutes to soften. Warm over a low flame, stirring constantly, just until the gelatin is dissovled and the mixture clears. Stir the dissolved gelatin, 1/2 cup sugar, and raspberry brandy into the 1 1/3 cups of purée. Set aside. Whip the heavy cream. Slowly fold the prepared raspberry purée into the whipped cream. Fill the prepared mold with the cream mixture. Cover with plastic wrap and freeze at least 6 hours, preferably overnight. To Finish the Mousse Cake: Remove the frozen cake from the mold by lightly heating the side (and bottom, if usinfg a cake pan); a hair dryer can be used. Turn out the mousse cake on a plate; then invert to your serving plate, cake side down. Pour the warm jelly on the frozen cake and spread evenly with a spatula to form a glaze. Allow the cake to stand at room temperature for 1 hour to thaw; then refrigerate until 1/2 hour before serving. Decorating the Mousse Cake: Using a pasry bag with a star tip, fill with whipped cream and garnish top of each slice with whipped cream, a whole raspberry and fresh mint leaf. To Serve: Coat the bottom of each serving plate with 2 to 3 tablespoons of raspberry sauce. Place a slice of cake in the center of each plate.